OpenSimulator is an open source multi-platform, multi-user 3D application server. It can be used to create a virtual environment (or world) which can be accessed through a variety of clients, on multiple protocols. OpenSimulator allows virtual world developers to customize their worlds using the technologies they feel work best - we've designed the framework to be easily extensible. OpenSimulator is written in [http://www.ecma-international.org/publications/standards/Ecma-334.htm C#], running both on Windows over the [http://www.microsoft.com/net/ .NET Framework] and on Unix-like machines over the [http://www.mono-project.com/ Mono] framework. The source code is released under a [[BSD License]], a commercially friendly license to embed OpenSimulator in products. If you want to know about our development history, see [[History]]. OpenSimulator is an open source multi-platform, multi-user 3D application server. It can be used to create a virtual environment (or world) which can be accessed through a variety of clients, on multiple protocols. It also has an optional facility (the [[Hypergrid]]) to allow users to visit other OpenSimulator installations across the web from their 'home' OpenSimulator installation. In this way, it is the basis of a nascent distributed Metaverse. Out of the box, OpenSimulator can be used to simulate virtual environments similar to [http://www.secondlifegrid.net Second Life™], given that it supports the core of [http://wiki.secondlife.com/wiki/Protocol SL's messaging protocol]. As such, these virtual worlds can be accessed with the regular [http://wiki.secondlife.com/wiki/Alternate_viewers SL viewers]. However, OpenSimulator is neither a clone of Second Life's server nor does it aim at becoming such a clone. On the contrary, OpenSimulator lacks support for many of the game-specific features of Second Life (on purpose), while pursuing innovative directions towards becoming the bare bones, but extensible, server of the 3D Web. OpenSimulator allows virtual world developers to customize their worlds using the technologies they feel work best - we've designed the framework to be easily extensible. OpenSimulator is written in [http://www.ecma-international.org/publications/standards/Ecma-334.htm C#], running both on Windows over the [http://www.microsoft.com/net/ .NET Framework] and on Unix-like machines over the [http://www.mono-project.com/ Mono] framework. The source code is released under a [[BSD License]], a commercially friendly license to embed OpenSimulator in products. If you want to know about our development history, see [[History]]. Out of the box, OpenSimulator can be used to simulate virtual environments similar to [http://www.secondlifegrid.net Second Life™], given that it supports the core of [http://wiki.secondlife.com/wiki/Protocol SL's messaging protocol]. 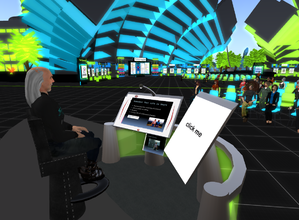 As such, these virtual worlds can be accessed with the regular [http://wiki.secondlife.com/wiki/Alternate_viewers SL viewers]. However, OpenSimulator does not aim to become a clone of the Second Life server platform. Rather, the project aims to enable innovative feature development for virtual environments and the Metaverse at large. * Supports 3D virtual spaces of variable size within one single instance. * Supports multiple clients and protocols - access the same world at the same time via multiple protocols. * Supports realtime Physics Simulation, with multiple engine options including ODE. * Supports realtime Physics Simulation, with multiple engine options including Bullet and ODE. * Supports clients that create 3D content in real time. * Supports inworld scripting using including LSL/OSSL and C#. * Provides unlimited ability to customize virtual world applications through the use of [[IRegionModule|scene plugin modules]]. For a more extensive list, see the [[Feature Matrix]]. * Participate via [[IRC]]. There are channels for users and developers. * Participate via the mailing lists - [https://lists.berlios.de/mailman/listinfo/opensim-users opensim-users] (for users) and [https://lists.berlios.de/mailman/listinfo/opensim-dev opensim-dev] (for developers). * Participate via the [[Mailing Lists]]. There are mailing lists for OpenSimulator use and development, as well as broader topics such as education and the Hypergrid. * [[WikiStructure|Contribute to this wiki]], making the OpenSimulator documentation even better. * [[WikiStructure|Contribute to this wiki]], making the OpenSimulator documentation even better. Don't be afraid of making mistakes - they can be easily corrected. * Report [[bugs]] or submit [[Submitting code to OpenSim|patches]] via our [http://opensimulator.org/mantis/ mantis bug tracker]. If you're submitting code, please read through the [[Contributions Policy]] before starting. * Create an OpenSimulator related project hosted on the [http://forge.opensimulator.org Forge] or [[Related_Software|elsewhere]] on the web. In the forge there are over a dozen registered projects, and it's a great way to further extend the OpenSimulator community. * Create an OpenSimulator related project hosted on the [http://forge.opensimulator.org Forge] or [[Related Software|elsewhere]] on the web. In the forge there are over a dozen registered projects, and it's a great way to further extend the OpenSimulator community. * Participate to open content creation for OpenSimulator. More details at [[Artist Home]]. * Participate in the weekly [[Office Hours]] for OpenSimulator development. * Participate in one of the weekly [[Office Hours]] for OpenSimulator. We currently have weekly office hours for development, wiki work, and testing. Make sure to read through [[Contributions Policy]] before starting participation. It has the policy, guidelines, and licensing conditions for the OpenSimulator project.